Club Chairman Ivor Beeks and Manager Lawrie Sanchez spoke to fans in the Vere Suite following the last home of the season at Adams Park on Saturday. After Beeks' speech, where he updated fans on the situation with proposed changes to the Club constitution, Sanchez said "We're putting together the seeds of a good team. What I will guarantee is wherever we finish this season we will finish higher next season if I can have one, two or possibly three of the players that I am looking for. 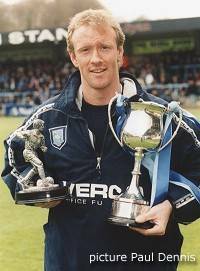 Martin Taylor pipped hot favourite Sean Devine by a solitary vote to take the joint Bucks Free Press/Delbeck Champagne Wycombe Wanderers Player of the Season Award for 1999/2000. Taylor, runner up for the past two seasons, received the award prior to Saturday's 1-0 home defeat to Luton Town. Jason Cousins topped the votes last season while this season Devine has already claimed the Independent Supporters Club award. Dave Carroll won the votes for the Official Supporters Club Player of the Season award and picked up his trophy prior to the Notts County game on Good Friday. Wycombe Wanderers Reserves suffered yet another loss as they played their penultimate game of the season at Gillingham on Wednesday afternoon. A very inexperienced side went down 2-0 to the Kent side. Wycombe are still looking for a top ten spot after the Easter programme saw a win and loss for The Blues. A 2-0 Good Friday victory over Notts County at Adams Park moved The Blues to tenth place and they remained their despite the 2-1 reverse against Reading on Easter Monday. Lawrie Sanchez has set his sights on gaining the most Division Two points since the departure of Martin O'Neill in 1995. The Wanderers need two more points to equal the total of 60 set on the way to claiming 12th spot at the end of the 1995/96 campaign and 14th spot in season 1997/98. Wycombe Wanderers Youth Team clinched the top spot in The Football League Youth Alliance Southern Division One after a hard fought 1-0 victory against Brentford at Tolworth on Saturday morning. Substitute Johnny Dixon got the vital goal in the 69th minute when he skillfully controlled Eddie Gray's pass before sliding the ball past Bee's 'keeper Danny Coleman. A double half-time substitution swung the game Wycombe's way and top scorer Leeyon Phelan could have scored five minutes into the second-half when he slid a Dixon cross the wrong side of the far post. However, that miss was forgotten when Dixon scored his ninth goal of the season to ensure that Wycombe were celebrating at the final whistle. Close to 50 Wycombe Wycombe fans travelled to Tolworth to see Gary Goodchild's side confirm the first silverware for a Wycombe side since the reserves won the Capital League in season 1994/95. As hinted on Chairboys on the Net earlier in the week, Martin Taylor has signed a new two year contract for Wycombe. Lawrie Sanchez completed the deal on Tuesday after a month of negotiating with the Blues 'keeper. 33 year old Taylor joined Wycombe on a permanent basis in the summer of 1997 and made his 150th appearance for The Blues last Saturday against Colchester - where he kept his 12th clean-sheet of the season. Speaking of the deal on The Blues News radio show on 1170am, Taylor said "I'm a very committed man. I stayed at Derby for 12 years. I can still see the Club going forward, we've turned the corner now and we've had a great season this year with the same players we had last year. Hopefully with one or two more signings who knows what can happen?" Taylor also said to the Bucks Free Press "I've taken a pay cut but it's not about money for me. I'm happy here at Wycombe and I was glad to stay. I never had any thoughts of leaving"
A relatively strong Wycombe reserve side were overrun by 4 goals to 1 against Bournemouth in the Avon Insurance Combination match at Adams Park on Tuesday afternoon. The watching Lawrie Sanchez will have seen little to prompt any rash changes for Friday's game with Notts County as The Blues were given the run around in wet and windy conditions. The visitors took 12 minutes to take the lead when Wade Elliott slotted past Mark Westhead after being given too much in front of goal. Elliott also scored against The Blues in the recent Division Two meeting with The Cherries at Dean Court. John O'Neill added another three minutes before the break and a mystery handball allowed Jason Tindall to make it 3-0 from the spot after 56 minutes. Wycombe pulled goal back on 81 minutes when Lee Holsgrove converted from close range after Matt Brady's shot from the left side of the penalty area had been blocked. The Cherries confirmed their superiority when Tindall sent a bullet header past Westhead with two minutes left on the clock. Danny Senda and Mo Harkin were shown yellow cards, while there was another set-back for Alan Beeton when he was forced off with a back injury late in the second-half. The result leaves Terry Gibson's reserve side anchored to the bottom of the Combination table with just nine points from 19 games. They finish their campaign with away games at Gillingham on Wednesday 26th April and at Champions elect, Millwall, on Tuesday 2nd May - both games kick-off at 2.00pm. It was a satisfied Lawrie Sanchez that spoke to the press after last Saturday's 3-0 victory over old rivals Colchester United. "It was a good performance and comprehensive victory. There's enough lads here who know the history between the sides and we said let's get at them and to be fair I thought we were excellent in the first-half. It was one-way traffic and the only thing you worry about is if you don't score when you're on top, they might sneak it. In the second-half they've come out and had a go and we've probably scored against the run of play. But having scored one there was only team going to win it. Brownies come in with a cracker to finish the game off and send the fans home happy. That's one for the players to the fans and a thank-you for this year." Sanchez was also pleased that some of the deadball movements were now reaping rewards. "I said to the players a few games ago we need to start making free-kicks counts because they can turn the game when we're not scoring goals in other areas and that's shown up in the last three games we've played - four goals is excellent. It shows the difference having a reasonably big man, and Rhino is a big man, up there who can head the ball and he's done excellent in the two games he's played for us." The Club have announced full details for next season's Season Ticket and Match Day entrance prices to Adams Park. In a push to bring in more cash to the Club, supporters now have the chance to purchase a three year season ticket at current prices. All child and senior citizen prices have been held or reduced as an added incentive to attract new season ticket holders. The Club are also continuing their 'Cashback' policy where current Season Ticket holders who introduce a new Season Ticket holder, receive 25% back of the introduced season ticket price. Match day prices see a general price increase of �1 for adults, with the exception of the Valley End Terrace, which remains at �9 advance/�10 on the day. Children's Season Tickets are again great value at �23 for under 10's and �46 for under 16's. Lawrie Sanchez is hoping to finalise the details of a new contract for Wycombe 'keeper Martin Taylor this week. Speaking after the 3-0 victory over Colchester, Sanchez said "I'm hoping to resolve something with Martin this week. He wants to stay and we want him to stay and hopefully we can thrash something out. The major pro's will all be in contract and we will have a base to build on next year." Sanchez added "The future is looking rosey, we've got Notts County this week and Reading - teams we are capable of beating and finishing above." Wycombe finally beat off old rivals Colchester United at Adams Park on Saturday by three goals to nil - all the goals coming in the second half - a brace from Keith Ryan and a last minute screamer from Steve Brown sending the Wycombe fans home happy. 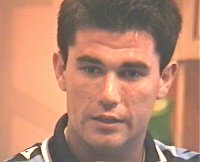 With Division Two safety sealed the previous week at Chesterfield, any fears that Lawrie Sanchez would field an inexperienced side were quelled before the game when the Wycombe boss said "It will be an experienced team because I understand that there is a lot of history between the two clubs and we'll be wanting to win the game. We were unfortunate to lose down there and the referee ruined the game from the word go". Saturday's victory lifts The Blues to 11th place in the table with four games left to play. Click here for Wycombe v Colchester report and OPTA stats. The Youth Team came within seconds of clinching 1st place in Division One of the Southern Football League Youth Alliance after being held 2-2 by Swansea City at Molins Sports Ground on Saturday morning. Goals from Paul Johnson and Ryan Gostick but The Blues ahead after falling behind early on but the Welsh side equalised with virtually the last kick of the game. Gary Goodchild's side now have games at Brentford on Saturday 22nd April and home to Wolves on Saturday 29th April to grab the two points needed to guarantee the title. Wycombe went out of the Berks and Bucks Senior Cup on Tuesday evening after throwing away a 2-0 lead against Reading. Both sides fielded relatively strong line-ups, with The Royals giving ex-Wanderer Keith Scott a run-out along with recent �100,000 signing from Portsmouth Sammy Igoe. On a wet and windy night it was Wycombe who dominated the first half but took until the stroke of half-time to take the lead when Matt Brady converted a free-kick from Mo Harkin. Wycombe went further ahead just after the hour mark when Jermaine McSporran found space on the left before sliding the ball past The Royals 'keeper. However, Wycombe collapsed during a sixteen minute spell which saw the visitors put four goals past Mark Westhead and run out 4-2 winners. Wycombe returned from Chesterfield on Saturday with three points to virtually guarantee Division Two safety for another season. Second-half goals from Keith Ryan and Sean Devine saw the Blues win 2-1 - with Martin Taylor saving a first-half penalty and Dave Carroll being shown a red card in the second. Saturday's defeat for The Spireites all but condemns the Derbyshire side to Division Three and Spireites Manager John Duncan was the target of 'Duncan Out' chants from home supporters during and after the game. They got their wish on Tuesday when Duncan was shown the door. A recent takeover has seen speculation that Nigel Clough will soon be manager and there are plans to move to a new ground. Before the Chesterfield game, Wycombe Manager, Lawrie Sanchez said "We need to set out like a house on fire like we did against Gillingham. I'm disappointed we didn't get something out of the game (Bristol City). We've played a hell of a lot worse and won games. We would have gone 10th if we had won and it would have been a shot in the arm for everyone. We've got Chesterfield coming up, Colchester and Notts County. We've got a great run-in and I was hoping we would go through the season undefeated - I want to finish in the top twelve. I'm hoping they've (Chesterfield) have got the same manager. It's a place we should go and get some points from." Click here for Chesterfield v Wycombe match report. Michael Simpson, the player some Wycombe fans love to hate has been backed by Wycombe Manager Lawrie Sanchez. Speaking after last Saturday's defeat to Bristol City, Sanchez said "I think he's been one of our best players all season. No matter how we play he's always looking for the ball. He does give the ball away now and again but he so much of the ball and that's why people notice him more. His passing completion are amongst the best in the team, week in, week out. He's been in the top three or four players here this season. I had criticism when I was at Wimbledon - as long as I pick him that's all he's got to worry about." Afterthe previous Tuesday's 'go get 'em policy' against Gillingham, Wycombe took too long to get going against Bristol City at Adams Park on Saturday - a 2-1 defeat seeing The Wanderers drop down to 14th place in the table. Having fallen behind to an unfortunate deflected goal in the first-half, Wycombe dragged themselves back into game in the 63rd minute when Sean Devine popped up to score his 23rd goal of the season. However, The Wanderers failed to take the initiative, conceeding again within three minutes and despite a late flurry, including a dramatic last minute header from substitute Jamie Bates, it will be a little longer before Second Division safety is guaranteed for another season. Click here for Wycombe v Bristol City match report and OPTA stats. Wycombe's Youth Team continued their unbeaten in the Southern Merit Division One of the Football League Youth Alliance with a 2-0 victory over Luton Town on Saturday. A memorable individual goal from Johnny Dixon was complemented by Leeyon Phelan's second half strike that puts the youngsters in second place in the table - level on points with leaders Portsmouth but with two games in hand. Next game for the Youth Team is on Saturday (8th April) when they are away to Notts County in the Youth Alliance. Long term injury casualties, Jamie Bates and Paul Emblen returned to action on Wednesday afternoon for Wycombe's reserve side but couldn't prevent a 7-0 thrashing at the hands of Ipswich Town in the Avon Insurance Combination at Portman Road. Bates had been missing from the Wycombe team since picking a leg injury in the game at Colchester back in January, while Emblen broke his ankle against Brentford last November. Emblen had Wycombe's best chance during a one sided first half that saw the home side score five goals through Neil Midgley (13 and 36), Marco Holster (21), Jonas Axeldal (42) and Stuart Niven (45). Emblen's effort came in the 18th minute but the ball was cleared off the line before a scrap between Emblen and Town defender Manuel Thetis ended with yellow cards for both players. Lee Holsgrove also picked up a yellow card for a late challenge on Anders Koogi in the 27th minute. Ipswich added two more goals late in the second half through Axeldal (73) and Holster (75) to all but condemn Wycombe to the 'wooden spoon' in this season's Combination table. Andy Baird's 83rd minute goal was enough to see Wycombe beat Gillingham 1-0 at Adams Park on Tuesday and take The Wanderers close to Division Two safety for another season. After Saturday's 2-0 reverse at Bournemouth the danger signs were there again but with the return of Sean Devine a major influence, Wycombe kept plugging away against play-off chasing Gillingham and eventually got the break through. The victory lifts Wycombe to 13th place in the table with 49 points from 39 games. Click here for Wycombe v Gillingham match report. While Wycombe were beating Gillingham at Adams Park, Mo Harkin scored on his Northern Ireland Under 21 debut when he came on as substitute in their friendly game against Malta. Sean Friars set Harkin up for the 89th minute goal as the Irish ran out 2-1 winners. Premiership Tottenham Hotspur have signed up 14 year old Wycombe Wanderers youngster Michael Malcolm in a deal that could be worth close to �1million to Wycombe. Malcolm, a forward, has been associated with Wycombe since he was ten years old has not even played for The Wanderers Youth Team but has been signed by the North London side in a complicated deal. Wycombe will initially receive �10,000 from Spurs and further payments will be made depending on his progress to the First Team, number of appearances and possible England caps. Realistically the deal could be worth around �200,000 to Wycombe if Malcolm makes First Team football for Spurs.